Ljubov Kalmykova was born 02.04.92, in Saint-Petersburg, Russia. 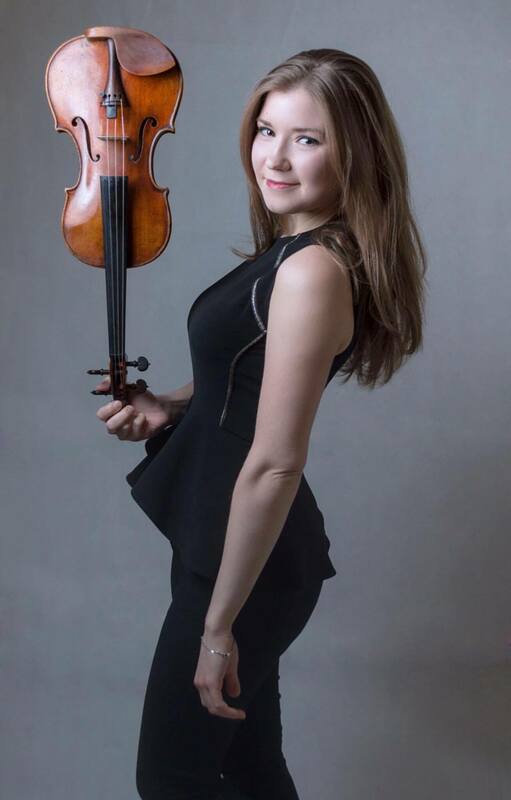 She began to play violin at the age of 6. When she was 12, she moved to Norway. Since 2006 Ljuba had Isaac Schuldman, Professor at the Norwegian Academy of Music, as her teacher. From 2008 – 2011 she studied at the Foss Gymnasium in Oslo and at the Barratt–Due Music Institute (at Young Talents Program, in conservatory class). Since 2011 she is studying at “Musik und Kunst Privatuniversität der Stadt Wien“ with Prof. P. Vernikov, currenly at the Master Degree Program. Since 2015 Ljuba is also making Chamber Music Master degree at Universität für Musik und Darstellende Kunst Wien with Prof. J. Meissl. In 2011 she was invited, as one of Barratt-Dues best students, to play in Oslo Philharmonic Orchestra. And from 2013 she is member of Gustav Mahler Jugendorchester. October 2014 Ljuba won 1st prize at the European Music Competition “Citta di Moncalieri”. Ljuba is also active as a chamber musician. She is a prize-winner of the chamber music competition “Fidelio” in Vienna (November 2013) with string quartet. She plays also in duo with her sister (Nadja Kalmykova), called Twin Duo. Twin Duo won all Norwegian national competitions, as well as “Absolute Winner” of Chamber Music Category at the European Music Competition “Citta di Moncalieri”and became finalists of international competition “Traditions and Modernity” in Russia. In 2012 the Duo was performing inWien Musikverein. Since 2015 Ljuba is part of string quartet “Selini”. The quartet already had a chance to perform in the best concert halls in Austria (Vienna Konzerthaus and Musikverein), and in other european countries. She takes part in different music festivals and master classes. Among others: “Kronberg Academy”, “Sion Festival”, “Wiener Meisterkurse”, “Astona International”, “Festival Lucca Estate”, “Valdres International Festival and Academy”, “Norwegian Youth Chamber Music Festival”. She has also performed at “Festspillene in Bergen” and “Sørum Festival”. She played on master classes with Pavel Vernikov, Miriam Fried, Sergey Stadler, Robert Rozek and Henning Kraggerud.